We welcome Nick back to Brum where he ran a successful folk club for many years. 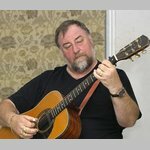 With his fine rich voice and superb guitar playing you will hear a great ballad singer of English traditional songs. His Latest Cd “ My love you have won to keep” has had rave reviews. A night not to be missed.